Love is in the air, because Valentine’s Day is a week away! While there’s still time to buy a gift, making one is a great way to express yourself in a more unique way. Plus, it’s generally a great way to go if you’re on a budget, while still being just as meaningful as a store bought gift. Today’s DIY works perfectly any time of year, but especially as a Valentine’s gift for that special mutant in your life. I got the idea for this DIY after seeing this item on Etsy. I loved the concept, but wanted to try my own, more elaborate, version of it. DC and Marvel conveniently have done “love” themed covers, which makes it fairly easy to locate a cover that has iconic characters embracing/kissing, like Rogue and Gambit on the comic I used for this DIY. This DIY can be as simple or elaborate as you’d like to make it. What I enjoyed about the original item I took inspiration from, was having something glued to the back of the cut-out image to give it more dimension in the shadow box. 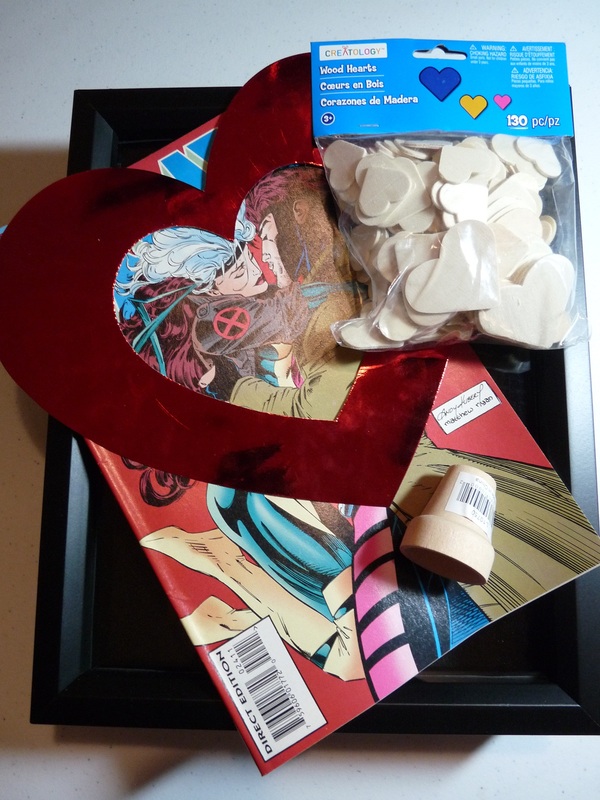 So, if you want to keep it simple, you can simply cut out a heart shape of your chosen image, back it with cardboard, glue it to something small like a wood block, and glue the wood block to the center of the shadow box backing. Then you’ll have a simple but fun piece of comic art to display in your home or to give as a gift. Create a heart stencil, trace it around your image, and cut it out. Cut out the same heart shape onto a piece of cardboard – I cut the cardboard piece a bit shorter than my main image so you wouldn’t see the cardboard edges. Mod Podge them together. I picked up a bag of wood hearts and a little wood piece (I think it’s actually a little wood flower pot) at Michael’s. The wood piece serves as the object that pushes my heart image out above the rest of the backdrop. I painted the hearts red, and the wood piece black. I went through the comic and cut out some choice panels I wanted to use for the background, arranged them onto the backdrop piece of the shadow box, and Mod Podged them on. Once that had had time to dry, I applied another layer of Mod Podge and stuck on my painted hearts. I allowed that coat of Mod Podge to dry, before applying another few coats over the entire piece. Then, using some E-6000, I glued the wood piece to the back of my heart cut-out, let it dry, and then glued it to the center of the backdrop piece. Once everything was sufficiently dry (give it at least a few hours or overnight) I popped the backing into the shadow box frame. Now you have yourself an arty, unique piece of geeky home decor that will look great on someone’s wall! If you end up tackling this DIY, or it inspires you to do something else, we’d love to see the results! If you ever have any questions regarding our DIYs, or want to share your own DIYs with us, you can contact us here, on Facebook, or on Twitter. I am simultaneously overwhelmed by sweetness and a feeling of distress for the destroyed comics (he said as if there were some shortage of early 90s X-Men. Also referring to himself in the third person…). Nice but I would not want to destroy (Jim Lee?) Xmen art. I would generally agree with you, but I still feel uncomfortable about removing them from their story context. I already foresee an argument that you’ve actually captured the essence of Rogue and Gambit’s story here, but while the art is preserved the work of the writer is not. Again, well loved as Jim Lee is, there’s no shortage of his work, I’d feel much more uncomfortable doing this with older comics that some collector might be desperately searching after. I wonder if there’s something in male comicdom specifically that sees it this way or if its just comic book insiderdom that woman have not always been accepted into. Either way I regret that feeling as I would love to give or receive one of these without guilt. I would honestly be shocked if anyone would ever craft with an actual rare comic. That’s just crazy, I think we all know that. These are comics that are in abundance and generally not from some ground breaking issue.